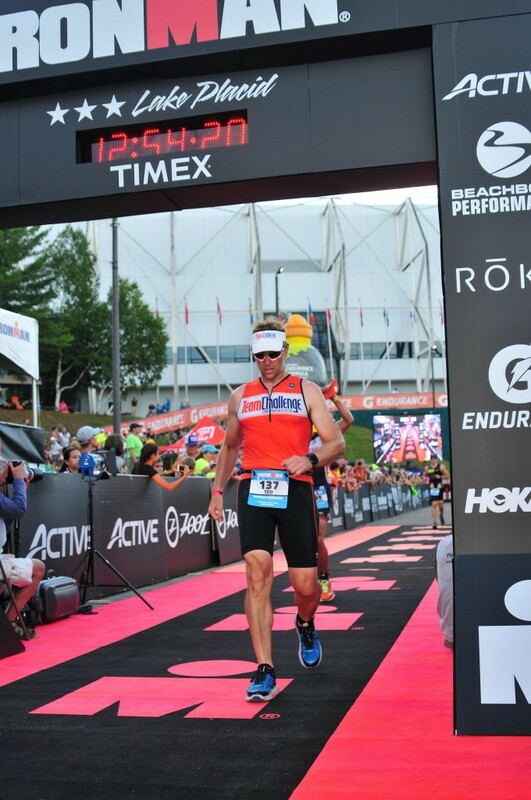 September 2016 – Most people agree that doing an Ironman race is an extraordinary feat. But to do two Ironman races within one nine-week window seems exceptionally astounding. Do you know anyone who would do such a thing? Chaffetz Lindsey’s own Ted DeBonis, that’s who. For those who don’t know, and for those who could use the refresher, a full Ironman race is comprised of a 2.4 mile swim, a 112 mile bike ride, and a 26.2 mile run. Anyone who volunteers to take on the challenge of participating in one Ironman is surely committed, but one who does two – virtually back-to-back – is certainly inspired. 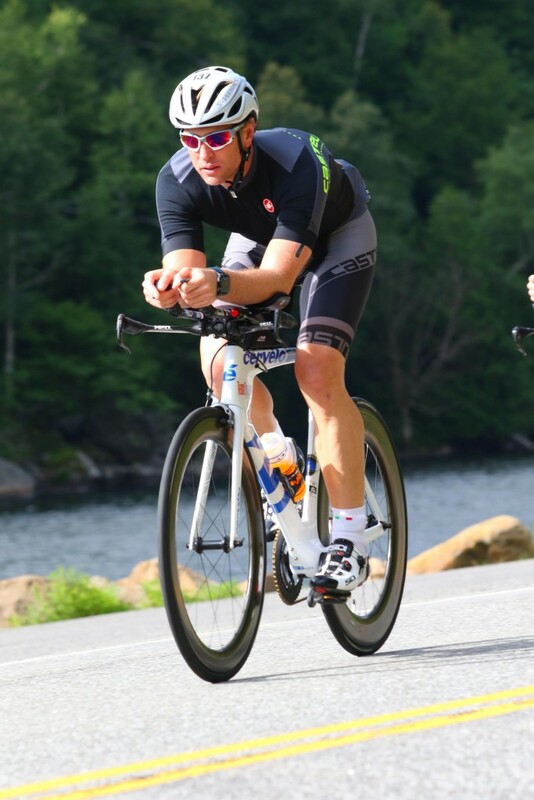 Ted participated in Ironman Lake Placid on July 24th and will be competing in Ironman Maryland on Saturday, October 1st. Though he has done many shorter distance events, as well as some half-distance Ironman events, Lake Placid was his first full-distance Ironman. Ted registered for Lake Placid early last year as part of a multi-year plan to build up to that distance. Very shortly after that, his daughter went through a terrible health episode that required a week-long stay in the hospital. After extensive testing, she was diagnosed with an autoimmune disease called Crohn’s, which causes stomach inflammation that results in horribly painful stomach aches and difficulty digesting food. In an effort to deal with their daughter’s diagnosis, Ted and his wife, Elyse, read everything they could about Crohn’s, spoke with everyone they could and took every affirmative, positive step they knew to take. For Ted, one meaningful step he knew he could take was joining Team Challenge, which is the fundraising endurance team for the Crohn’s and Colitis Foundation of America. Team Challenge was participating in the Lake Placid Ironman in July and will be participating in Ironman Maryland this weekend. According to Ted, signing on for that second race seemed a natural thing for him to do. In case anyone is wondering, Ironman training is really hard, not just physically but mentally. It requires a lot more than sitting on a bike for four to five hours a couple days a week. It requires long-term dedication and long-term build-up to get the body and mind ready for the challenge of that 11, 12 or 15-hour day. The build-up must be slow and patient with gradual development, or one’s body won’t adapt well to the demands. Ted has been building up to the Ironman distance for two years. This includes doing eight shorter distance races last year, which were intended to help him acclimatize to long-distance endurance racing. With that background, he had a six-month period leading up to the Lake Placid race in which he built up the distance to swim, bike, and run, taking care to build slowly to avoid injury. Ultimately, three weeks from the race, he was swimming up to six miles a week, biking three or four days a week (with at least one ride of 80 miles), and running two days a week (with one run at 16 miles). I asked Ted to tell me his favorite part of his training experience. “That’s an easy one,” he said. 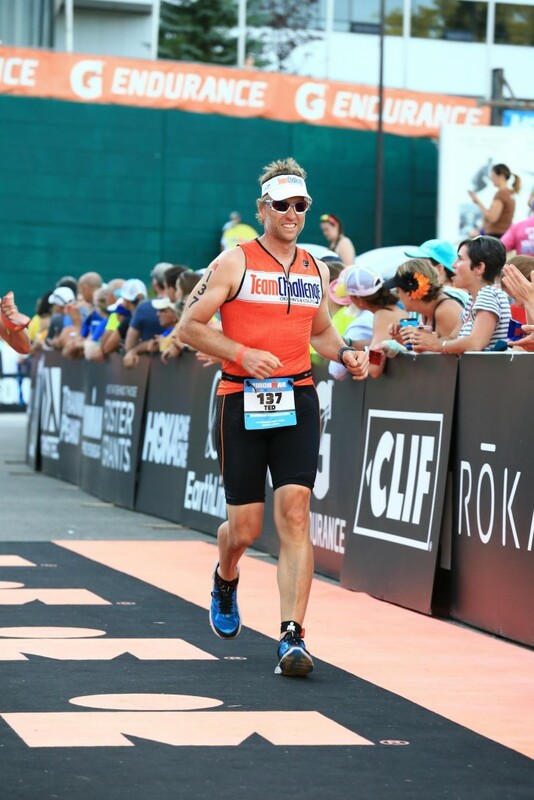 “Being a part of Team Challenge and participating in Ironman Lake Placid has allowed me to be a part of a tremendous community of people. The positive energy, enthusiasm, and demonstration of human spirit at these events is awesome. “You feel that from the racers, the volunteers, and the spectators. It seems like everyone has a story like mine – they’re motivated by some event or challenge in their life, they’ve overcome something that’s inspired them to show the strength required to do this race, they’re reacting positively and proactively for themselves and others. And the support and respect that the members of the community provide to others is really unique. I couldn’t help but ask what he has liked the least. “It’s easy to say the long training sessions when I’m tired or less motivated. However, despite those long sessions, I’ve always been able to think back to my reasons for the training — my goals, the people who I know are supporting me — to refuel my motivation. For me, the toughest part is the selfishness that the training requires. Ted has some advice for anyone considering training for an Ironman for the first time. “Go slow and be patient. You hear about ‘off the couch’ Ironman finishers, but I think it’s rare and definitely ill-advised. “You get 17 hours to complete the race, and you can do that with relatively little fitness coming into a good training plan. But it’s a recipe for injury and short-term involvement. A much smarter approach is to build up to Ironman by doing a lot of running – half marathons and marathons – over a period of one to two years, learning to swim with good technique and building your base over a period of time, and biking greater and greater distances so that mentally and physically you’re prepared for not only the six or seven hours on race day, but all those lonely hours on the bike leading up. That’s the best way to allow your body to adapt to what you’re asking of it. Clearly the rigorous training schedule requires a considerable time commitment throughout the week in addition to the weekends, so I asked him about how his work schedule was impacted. “Chaffetz Lindsey was a corporate sponsor of Team Challenge this year. The firm contributed to the team’s fundraising for the Crohn’s and Colitis Foundation. The financial help was of course very appreciated by Team Challenge and me, and I was proud to have the firm’s name on the back of my jersey at Lake Placid. I saved the biggest question for last. Will he do this again next year? 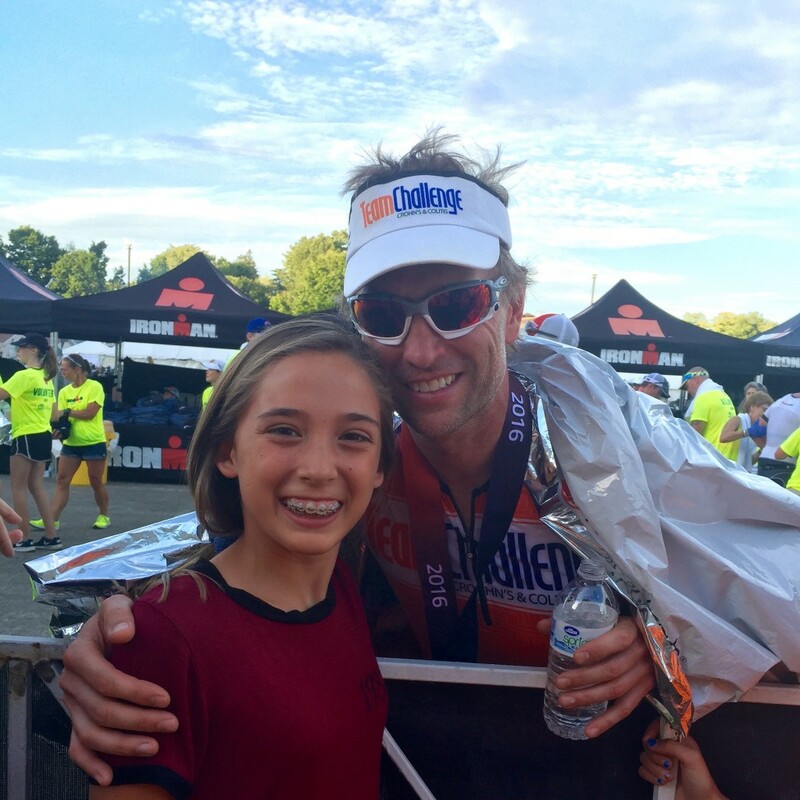 Ted doesn’t know this, but I reached out to his wife and children to get their thoughts on his tremendous commitment to completing two Ironman races. If you are interested in donating to Team Challenge or The Crohn’s & Colitis Foundation of America (CCFA), fundraising is done through individual Team Challenge members. Ted has a personal fundraising page, where you can learn more information about his family’s story and CCFA.